Inventory We are a resale marketplace, not a box office or venue. Ticket prices may exceed face value. This site is not owned by Harveys Outdoor Arena . Harvey's Outdoor Arena has been one of the most popular locations for summer concerts since opening back in 1944. 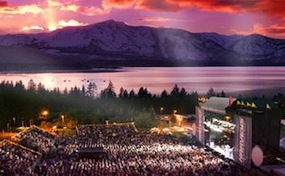 It has also been known as Lake Tahoe Outdoor Arena at Harveys among concertgoers. Harveys Outdoor Arena box office is located at 15 Highway 50 in Stateline, Nevada. The seating capacity is approximately 7,200 in this open-air venue. Harveys Outdoor Arena tickets have included artists like The Eagles, Elton John, Bob Dylan, Carrie Underwood, Bruno Mars, Lady Gaga, and many more. LakeTahoeBoxOffice.com is an independently owned and operated site that operates exclusively in the secondary ticket market. We are not at this time affiliated with any official website, box office, supplier, or primary vendor. Tickets on our sites are often above face value and have a tendency to change rapidly with market conditions. To order tickets for all Harvey's Outdoor Arena Lake Tahoe events please call any of our friendly staff at your convenience or follow the procedure online through the checkout.